The Oshkosh North Tennis Team are all smiles by the South Gate. Van Lieshout (center) voulnteers his time to help the newfound Oshkosh CTA, established in 2008. For many in the Oshkosh group, their first trip to New York City was unforgettable. When Rafael Nadal dispatched Novak Djokovic in the men's final, it was the conclusion of what was a wildly exciting 2010 US Open, not just for the players but also for the fans that flocked to Flushing Meadows from all across the United States over the course of 15 action-packed days. Yet, for certain attendees, such as those who are actively involved with tennis year-round in their hometowns as part of a Community Tennis Association (CTA), the pilgrimage to the epicenter of American tennis took on a deeper meaning. 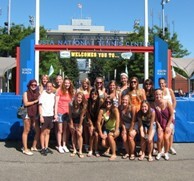 As part of USTA.com's recap of the 2010 Open, we will highlight some of the journeys made by these volunteer groups from different parts of the country. In the coming days, five CTAs will tell their stories of travel, tennis and triumph within their communities. Classified as "any incorporated, geographically defined, not-for-profit, volunteer-based organization that supports or provides programs which promote and develop the growth of tennis," the five CTAs that made it to New York City are but a sampling of over 1,000 CTAs accounted for under the umbrella of the USTA's 17 sections. The associations work primarily at the grassroots level to coordinate and maintain tennis programs and services, guaranteeing that they are open and accessible to all. Being at the US Open was not only a chance to take in a world-class Grand Slam tournament but also to spread the word about what progress is being made at the local level to preserve the game now being played by over 30 million people nationwide. "We're extremely pleased that for the first time ever we can utilize the national platform provided by the US Open to recognize the Community Tennis Associations around the nation that are in attendance," said David Slade, USTA National Manager for CTAs. "The US Open and the USTA's family of websites provide a great opportunity to increase awareness amongst tennis fans - many of whom attend the Open themselves - about the programs and services being offered by organizations around the country." For the group that travelled to the US Open, we brought 18 girls from our high school tennis team - Oshkosh North - and eight chaperones to enjoy the opening weekend of tennis. All the girls came up through a National Junior Tennis League (NJTL) which is ran in conjunction with the Oshkosh Tennis Association. We had a great time in New York, flying the red-eye into LaGuardia Airport on the Friday before the tournament began. Our Oshkosh bunch stayed at a hotel near the airport which furnished free breakfast, free shuttles to the Open, the subway station, and the airport - very convenient! The next day we attended Arthur Ashe Kids Day, taking in the activites in the main stadium and the outside courts. We checked out the QuickStart Tennis courts and clinics, along with the various musical acts. On Sunday, we had a free day to sightsee before returning for Day 1 of the Open, so we all took the No. 7 subway train into Manhattan, experiencing the Empire State Building, Central Park, Times Square, and all the other wonderfully unique sites in that area. Then we geared up for a jam-packed Monday where we caught all the opening day matches on the grounds, until around 5:00 p.m. when we all had to hurry to catch the bus back to the hotel, and then the shuttle to the airport, to fly home. All in all, it was a great experience for the girls and chaperones - hopefully we will make it back again!